Just recently, it has been the case that if England think you are good enough, then you are very definitely old enough. When Ollie Pope takes his place in the middle order for the second Test against India at Lord's on Thursday, he will become the third England debutant in four matches to be aged 20 or under, following Dom Bess and Sam Curran. Of the three, it is 20-year-old Pope's ascent that has been the quickest. In 2016, he was still playing school cricket for Cranleigh. His last game of club cricket in the Surrey Championship was little more than a year ago. The right-hander has had a prolific summer - his 684 runs in Division One of the County Championship bettered only by Surrey team-mate Rory Burns - following a similarly successful winter in Australia. In the notoriously tough Sydney First Grade competition, Pope racked up 994 runs for Campbelltown-Camden, a club that counts former England spinner Monty Panesar among its former players. It was while staying in Campbelltown, about an hour's drive from the Sydney Cricket Ground, that he learned not only about cricket, but also laundry and nature. "He had his own space that I called the Vatican, because that's where the Pope sleeps," said Campbelltown-Camden club secretary Jason Ellsmore, with whom Pope lived. "When it came to laundry, he didn't realise that in Australia we let our clothes dry outside. He asked me where the dryer was. His first life lesson was how to use a washing line. "Another time, his parents came over for a holiday and they went on a bush walk in the Blue Mountains. "They met a brown snake on a pathway. I'd said to him before that if you see a brown snake, you go the other way, because it can kill you. I think he just thought it was a stick." Such was Pope's impact on and off the field for Campbelltown-Camden that, when he left, he received a commendation in the New South Wales parliament from MP Chris Patterson, who is also the club's vice-president. In response, NSW minister for sport Stuart Ayres said: "It is a rare moment that a New South Wales member of parliament speaks with such passion about an Englishman." As well as that lofty recognition, Pope left a lasting impression on the Ellsmore household. "There was one time when I was cooking a roast dinner and he said: 'Have you ever heard of Yorkshire pudding?' I said I've heard of it, but I don't know how to cook it," said Ellsmore. "He missed the dogs he had at home, so looked after mine. He was happy around the barbecue with the other lads from the team, or sitting watching sport in the lounge with the dogs on his lap." When Pope learned of his England call-up, Ellsmore was one of the first people he called. "I was particularly touched that I got a phone call from him on Sunday night," he said. "He knew how happy I was. It's a shame that I can't be there on Thursday. Hopefully he's in the team for the Ashes next summer. I told him to make himself part of the furniture." Pope, who can also keep wicket, has made himself "part of the furniture" in the Surrey team despite having played only 14 first-class matches for the county. In that time, he has made four centuries, including one in his second match against Hampshire and 158 not out against a Yorkshire side captained by England skipper Joe Root. It was also against Yorkshire that Pope made his senior debut for Surrey in the semi-finals of the 2016 One-Day Cup, just weeks after leaving Cranleigh School. He made 20 from 23 balls. "I thought that his best route would have been in the shorter formats," said Cranleigh director of cricket Stuart Welch. "In one game against Tonbridge, he scored 120 with ramps and scoops, looking head and shoulders above everyone else on the pitch." Pope, who also played football and hockey for the school's first XI, needed special permission from Cranleigh to play for the Surrey second team. "It was clear that he would play international cricket at some stage, although maybe not this early," added Welch, who has also coached the MCC's Young Cricketers. "I've seen the likes of Alex Tudor, Hamish Marshall and Ross Taylor come through. I'd put Ollie in the top 5% of all the youngsters I've encountered." As well as Cranleigh, Pope spent his formative years at Guildford, one of the largest clubs in Surrey that also produced Ashley Giles, Rikki Clarke, Jade Dernbach and the Bicknell brothers. He made his first XI debut in 2013 at the age of 15. In the same year, he was part of a Surrey youth tour to South Africa that included Curran, as well as current Surrey team-mates Ryan Patel and Amar Virdi. 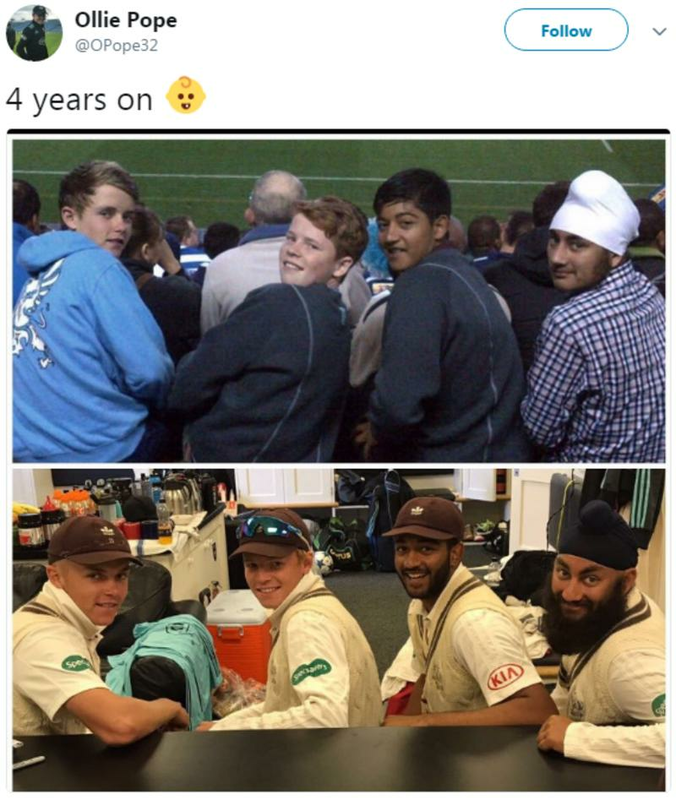 The quartet were pictured in Cape Town and again four years later when they played together for the Surrey senior team. Both pictures are pinned to the top of Pope's Twitter page. Now, Pope and Curran are set to line up for England at Lord's - Curran on the back of a man-of-the-match performance in the first Test at Edgbaston, Pope with a first-class batting average of 63.25.